You're using 12 GPIO lines to drive four displays. Now look at using a shift register or BCD to 7-segment controller chip. You can easily drive 16, 7-segment displays on 8 gpio lines (four for data, four for select). I Come from Germany and my English is bad... Sorry about that. 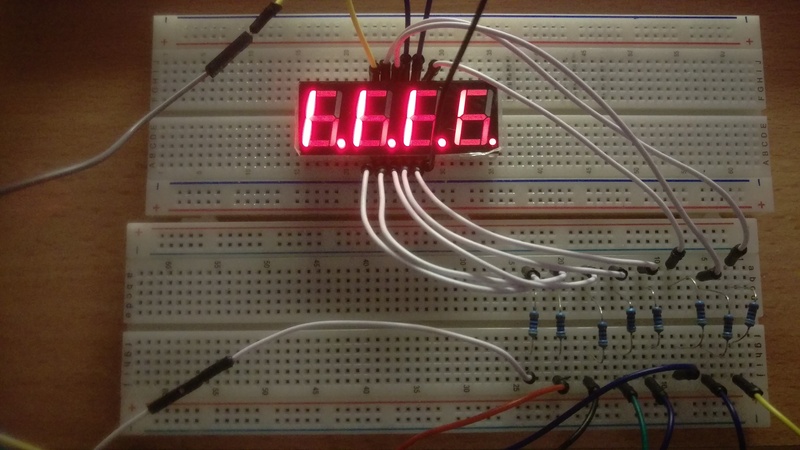 I try 5 days to run a 7 segment display like this example but it doesn't work. Cable 10 times checked segment for segment tested. Has anything changed python or so? How do you have your display wired give us a Fritzing diagram and/or a photo of your wiring? Are you using a BCD to 7-seg decoder? Are you using a shift register? Or are you trying to multiplex the display directly from the GPIO pins? First question is your 7 seg display common anode or common cathode? The OP doesn't tell us which model he's using. If it's the opposite we're going to have to turn all the logic upside down in his code. i have 7seg with common anode, i think he also. My theory is proven @icemann1978's LED is common anode, the code is written for common cathode LEDs. # Bert's code re-written for common anode LED arrays. Using Dougie's code (Many thanks) I got it working with a 3.3v 4 digit display with built-in resistor. I just went through this and wondered why I wasn't getting more than one digit. I copied Bertwert's original code, and apart from fixing the missing : eventually I realised the copy & paste had messed up the indents so the loop was not iterating through all four segments. ...is doing anything, since there is nothing connected to pin7/GPIO4, and it's not read in the script. Next step is converting this in a generic "display_script.py" reading its data from an external source. The fun part is the display cannot stop/starve (always dynamic). script "calculate_primes.py" outputs the value in chunck to a system ENV variable "7SEGDISP" , and "display_script.py" loops and constantly update the display according to the ENV variable "7SEGDISP". I want to avoid passing data via a file (SD card wear), and I know that one flaw in my idea is that both scripts needs to be started in the same terminal. I learned something(correct me if I am wrong): a python script does not read the updated env variable value in a terminal. It will keep the values it reads when it is invoked. SO I reverted back to my second idea of using a file on a ramdisk for communication(and it is working). I still wonder if there would be a better way. and this is the data being feed to the display (scrolling numbers) for proof of concept. I'm new to Python and I was wanting to make a digital clock for my bedroom. I tore apart an old LED digital clock that didn't work right, scavenged the digit mask from the old display and build my own display using tiny red axial-leaded "SuperBright" LEDs. I've got a couple of issues still outstanding with this approach, specifically the LEDs are *VERY" dim (I'll work on that, maybe using a higher voltage to the LEDs, switched by transistors. The second issue is that I would like the clock to be a 12-hour clock (AM/PM indicator is desirable, but not necessary). My display has an incomplete first digit so it can only display a "1" or nothing for the first digit. It looks like the only way to accomplish this would be to use "time.strftime" instead of "time.ctime" because it has the option of %H for 24-hr hours or %I for 12-hr hours. Does anyone have any suggestions on how to modify the code to display 12-hr time? The current code is using time.ctime() and parsing that. Change it to use time.strftime() and you can get the time in any format you need. does anyone of you how to get this working, using zerogpio istead of the 'normal' gpio. What about limiting two or tree segments simultaneously for a very short time and then light another bunch of 3 leds but do not allow all leds if needed simultaneously? Wouldn’t be safer? we have just recieved two of these https://www.aliexpress.com/item/4-Bits- ... 20e1e5d1a1 TM1637-for-Arduino-Raspberry-PI. We are looking for any help and advise with wiring and pinouts for use with our Pi-3's Also what would be the best code to use to allow us to use them as clocks?? looking forward to any and all assistance..
3x Pi-3 1 x Pi-2 1 x Pi-B+ 1 x Pi-B 2 xPi-Zero 1 x Pi Zero W and a massive ever growing box/room of bits and bobs for them! we have just recieved two of these https://www.aliexpress.com/item/4-Bits- ... spberry-PI. We are looking for any help and advise with wiring and pinouts for use with our Pi-3's Also what would be the best code to use to allow us to use them as clocks?? That is completely off topic for this thread. Start a new thread and post your question there. Eeer why is this OFF TOPIC?? I thought it was relivant due to the device and requirements!? Will start another thread but would have thought this one was appropriate and within in the RULES of the forum! It's 100% off topic because you're not wiring your LED directly to a set of 12 GPIO pins and driving them with python.